Shariq Sayeed, MD received his undergraduate degree in Biology at Emory University in Atlanta, GA, graduating in 1994. He received his Doctor of Medicine at Emory University School of Medicine in 1998. He completed his surgical residency in 2005 at the University of Rochester in Rochester, NY, followed by his Vascular/Endovascular Surgery Fellowship at the University of Pittsburgh Medical Center in Pittsburgh, PA. Dr. Sayeed is Board Certified in General and Vascular Surgery. 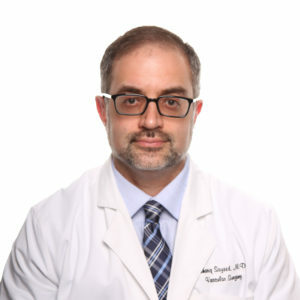 He is also certified in Vascular Sonography by the American Registry of Diagnostic Medical Sonography and has special interests in minimally invasive endovascular surgical techniques, management of carotid disease, aortic aneurysms, peripheral bypass grafting, and carotid stenting. His hospital appointments include Wellstar Kennestone Hospital and Wellstar Cobb Hospital.